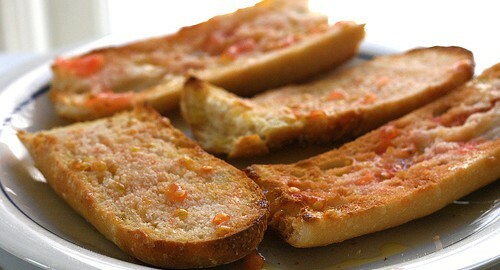 Catalan Pan Con Tomate – Steven Jay Katz, M.D., M.P.H. This bread is served at lunch and dinner in Catalunya, Spain. I modify the classic preparation. Perfect solution for day or two old baguette! Toast the bread. Rub fresh garlic on the bread. Rub tomato over the dry bread. Drizzle high quality olive oil on top using a teaspoon. Sprinkle a little salt. The bread should not be soggy. Serve with mains or many sides like hard and soft cheese, olives, smoked fish.